Today's modern business hubs demand the best technology, and Red Oak Coworking is no different! 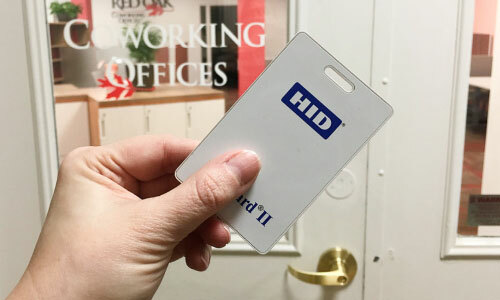 Every client enjoys keycard access at every entry point, powerful wi-fi throughout with dedicated hard-wired internet in offices, motion sensor lighting and onsite video surveillance, electrical and USB outlets at desks, large format ultra HD presentation screens in conference rooms, and free access to a printer/copier/scanner. In addition, personal peripheral equipment is welcome, such as printers and VOIP phones. Red Oak Coworking Offices offers a variety of desk, coworking and office options, all with the use of contemporary new office furniture! 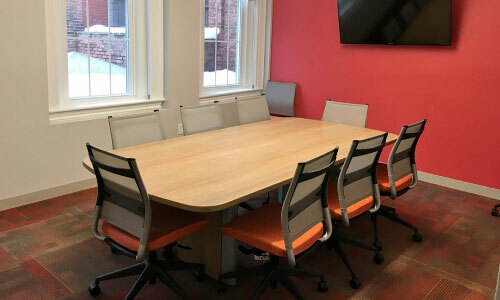 All coworking desks are electric sit/stand desks, and every office and coworking workstation includes lockable storage. The use of two conference rooms with ultra HD screens and online booking are included, as well as a full kitchen with tables and seating, two comfortable lounge areas, a large 8-seat library table, and daily use lockers. 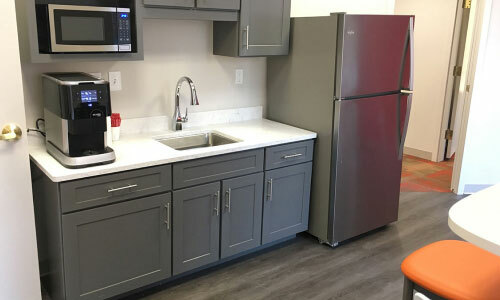 Red Oak Coworking Offices includes the conveniences every professional expects from their workplace, such as month-to-month leases, 24/7 access, climate control, wi-fi and all utilities, complimentary coffee services and filtered water, and janitorial service. Also included is the use of a business mailing address, shared lobby with the Manchester Chamber of Commerce, and a signature downtown location with plenty of food and shopping options. Wide Variety of Plan Options! Rent a desk or office month-to-month! Or rent a conference room for just a day! How Much Office Space Do You Need and Will a Coworking Space Fit Your Needs? How to Make a Private Phone Call in a Coworking Office Space?